The Texas Mountain Laurel is one of my favorite Arizona trees. They are so pretty when in full bloom in the spring and very fragrant. 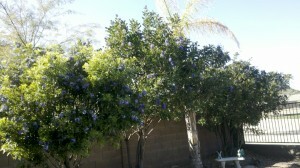 They are a medium growing upright evergreen tree that likes full sun and produces pretty purple cluster flowers. It grows to 8’x6′ when full grown. It is a nice tree for our smaller yards and is slow growing. The Texas Mountain Laurel is considered a low water use plant, likes full sun, and is hearty to 1 degrees. You can’t get better then that in Arizona. Be patient, it takes a while to grow. The trees in this picture are about 10 years old and were planted as 15 gallons. They are about 8′ tall right now and pretty much full grown. It is a low litter plant, evergreen, and very fragrant. Be aware, the blooms will bring bees but you can enjoy them from afar.